Any stump, any size in any location! Stump grinding utilises a powerful tungsten-tipped cutting wheel to grind stumps to below ground level. Our powerful yet highly mobile equipment gives us the ability to tackle any sized stump in any location. Our stump grinders are modified to outperform many much larger machines and far outperform anything in their class. We also have a small digger and a large track loader for a wide range of capabilities. We have multiple back up machines to minimise downtime and to ensure we have something appropriate for every job. Your property will always be left clean and tidy. 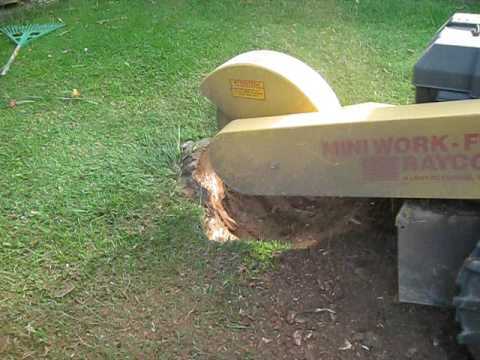 Our team of employees are specialists in stump grinding and are able to handle any sized stump in any area. After removing a tree the remaining stump always stands slightly above the ground which can create problems. With our specialised stump grinding equipment we can grind the stump below ground level so it can be grassed over or completely removed allowing you to replant on the same spot. All jobs will be sighted and quoted free of charge prior to any work being undertaken. Once the quote has been accepted by you, most stump grinding jobs can be completed there and then without the need to book a second visit. Prices for stump grinding start at $80+GST. Our charge schedule is based on the size and type of stump to be removed, difficulty, accessibility, surroundings, terrain, soil rock content and other factors. It is the property owners duty to determine the position of all underground services that may be in the area of activity. See below for a full checklist of things you should consider. We carry two million dollars Public Liability Insurance for both stump grinding and large tree removals for your peace of mind. Stumpmaster’s state-of-art equipment allows us to grind any stump, anywhere. This includes areas such as planter boxes and steep slopes. We are able to abseil our alpine machine on to areas such as cliff faces that you would never have thought possible. Even our larger equipment only requires an 800 mm gap (800 mm standard-sized gate). Our bigger grinder is self-propelled and highly mobile allowing us to get across difficult terrain and even climb steps to access stumps that are inaccessible to other large machines. In addition to stump grinding we also carry out large scale mulching and bush clearing work. Stumpmaster will always undertake a thorough clean up after each job. In most cases the only evidence that we were ever there is an absence of stumps and a happy customer. Speak to us at the time of quotation if you would like the excess stump mulch removed, or whether you may want to replant in the same position and we can estimate this for you.